Bible Assist Software may be redistributed freely in its original _install.exe file format and its _usb.zip file format. This redistribution restriction is to protect the software and its installed contents from alterations. Always try to download lastest version from Bibleassist.com. ALWAYS run Windows Defender or a virus checker! Very few may show a false positive. --> Bible Assist Software _install.EXE version and _USB.zip flash drive version can be freely redistributed on computers, laptops, and on other Microsoft operating systems that use Win XP and higher (Win 10). --> Bible Assist Software _install.EXE version and _USB.zip flash drive version can be freely redistributed on flash drive, DVD, and CD. For other redistribution methods not listed above or if further permission is required, please contact me. Other alternatives or methods of redistribution for Bible Assist Software may be available. 3.5 x 2 inch business card. 5.25 x 3.5 inch postcard. 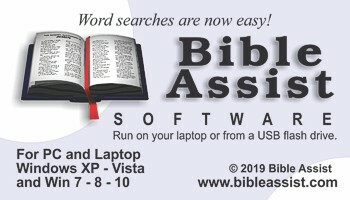 Download Bible Assist Software today, completely free.